AAA Annual Meeting, 2018. Photo courtesy of the American Anthropological Association and Josh Gold Photography. 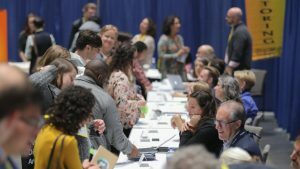 Earlier this month, the American Anthropological Association hosted their 117th annual meeting in San Jose, California. The events were a five-day whirlwind of presentations, panels, committee meetings, awards, and social gatherings. Among the 6,000 anthropologists and related professionals in attendance were hundreds of SAR alumni. 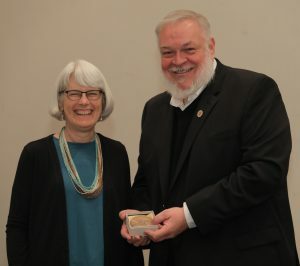 Alex Barker, AAA president, and Patricia Crown, recipient of the Alfred Vincent Kidder Award for Eminence in the Field of American Archaeology. AAA Annual Meeting, 2018. Photo courtesy of the American Anthropological Association and Josh Gold Photography. 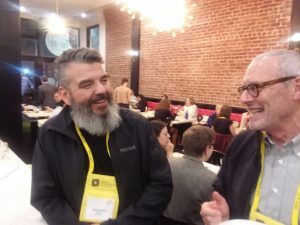 Three other SAR staff attended this year’s meeting and took advantage of the many opportunities to reunite with alumni and connect with new scholars and artists. NAPA/AAA Career Expo. AAA Annual Meeting, 2018. Photo courtesy of the American Anthropological Association and Josh Gold Photography. Anthropologists Chris Nelson and David Edwards at the SAR Alumni Reception. AAA Annual Meeting, 2018. Photo by Paul Ryer. As well as participating in the Careers Expo and other events for SAR, director of Scholar Programs Paul Ryer hosted the SAR alumni reception on Friday evening at the Tac-Oh restaurant. “It is fun to see so many alums again and to meet others for the first time. Even better is to watch these amazing scholars connect or re-connect with each other, and to learn a bit about their current writing and research.” For many of our alumni, the reunion is a special way to reconnect with scholars they see rarely. The event often spurs conversations about future research or potential new seminars – a program at SAR that brings together ten scholars for an in-depth workshopping of research at a critical stage. 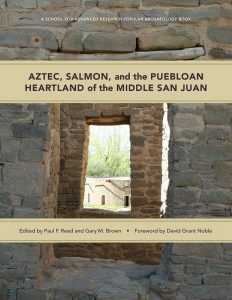 Aztec, Salmon, and the Puebloan Heartland of the Middle San Juan (SAR Press, 2018). One of the most significant ways SAR continues to inspire new scholars and inform existing researchers is through SAR Press publications. The first publications for the School were archaeological studies written by Edgar Lee Hewett and Sylvanus Griswold Morley in 1908. Since then, more than 300 titles have been published, and many have created seismic shifts in anthropological thinking. Senses of Place, edited by Steven Feld and Keith H. Basso, remains a course staple. Alfonso Ortiz’s volume, New Perspectives on the Pueblos, and Reconstructing Prehistoric Pueblo Societies, edited by William A. Longacre, transformed Southwest anthropology. Based on an advanced seminar at SAR, Writing Culture was licensed to University of California Press, where it has become a canonical text in the field. Sometimes from Santa Fe the reach of our SAR community is not fully visible. The AAA’s annual meeting is one of the best opportunities to be reminded of our ongoing and growing connections. See you in Vancouver in 2019, AAA! Learn more about the School for Advanced Research’s Resident Scholar Program, Seminar Programs, Internships, and Native American Artist Fellowships.